Unicorn: a mythical animal typically represented as a horse with a single straight horn projecting from its forehead. Alt. : a rare Datsun part, usually made of unobtanium. I took this rubber steering coupler from a 12/71 parts car recently. Its in amazing condition - the rubber is flexible and lively, NO CRACKS or other damage, no signs of aging, bolts/nuts are in perfect condition - no thread damage. I've used a wire wheel on the plates and bolts to remove rust, bathed everything in Metal Ready. I'd throw a coat of black paint on the plates but its too cold to paint right now. Offering it here to fellow enthusiasts before listing on any classifieds or eBay. Priced at $40, includes USPS Flat Rate Priority shipping. Thanks Mike, sorry for the wrong forum selection. Good deal I think, best of luck. Its certified UOS (Used Old Stock) - I make a few bucks, somebody gets a good OE part. I think we have a winnah! PM back to you. are these things really worth money??? I'm wondering the same, can't you just get aftermarket ones? I'm guessing this is for those that want original? This might be one of those cases where rubber is better that poly for a street car. The polurethane ones transmit too much road feedback thru the steering column. The oem ones I am guessing are NLA. I suggested @nix240z (http://www.240Zrubberparts.com) reproduce the steering rack bushings in the past. Maybe with the "sure to come" increasing demand for real rubber in instead of urethane he will reproduce them. The price point is certainly getting there. Maybe he will reconsider! It's not the material itself that matters, it's the properties of the material. Rubber can be made rock-hard also. That is the reason Steve gave me Charles. I've never heard of an accident caused by deteriorated rack bushings or steering couplers---has anyone?? What has happened to our DIY culture on this item? Let's see, what do we need? 1. 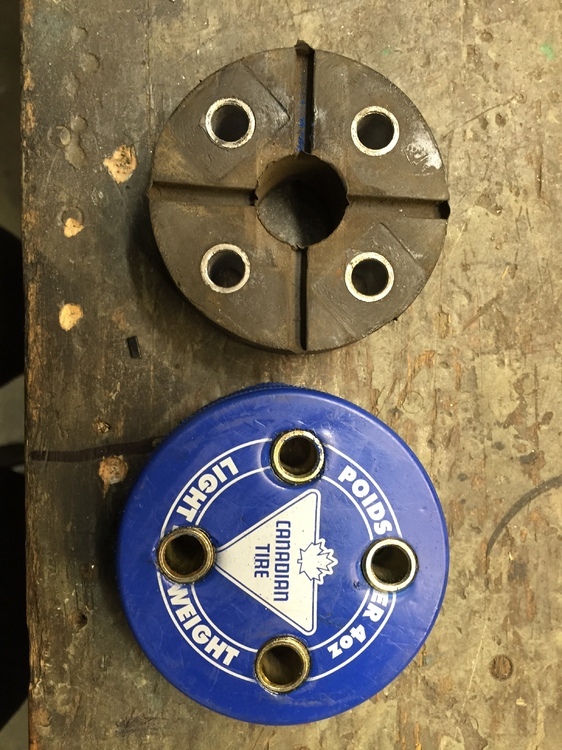 Use a hated polyurethane bushing as a pattern and source of the four steel hole lining bushings. You can also laboriously extract these bushing from your old rubber one too. 2. Acquire a chunk of rubber. Get a few different durometers. If your get 1/4 thickness of various durometers to build a sandwich and experiment with the steering feel until you get what you like. McMaster carr has a large variety of rubber types, some even with reinforcing layers. Rubber suppliers are surprisingly common. This stuff is not high tech. 3. Size and drill the holes using the old poly bushing as a guide. 4. Press the steel bushings into the holes. 5. Assemble on the car and go for a drive. I also plan on using the shortened bump steering knuckles from Arizona Z Car for a quicker turn ratio. Is it really that harsh with poly?? I bought one of MSA's packages of bushings years ago, on sale, and the only ID of manufacturer inside was an instruction sheet from Ground Control. So assume that my coupler is from GC. I haven't noticed any harshness at all, just a tighter feel at the wheel. I'm running 205/70-14 tires. Low profile tires could have a big affect on the problem. I also have an old worn-out spongy steering wheel cover. I imagine that a nice wood wheel would transmit the harshness also. I don't wear gloves though. Another factor. I too bought the MSA bushing pkg. thinking it was the way to go. After getting the car back on the road, I regretted that decision. I have eccentric bushings on the front control arms for camber adjustment so there went the stock rubber bushings. With poly in the rack and steering coupler, there was a lot of road feedback getting to the steering wheel - way lot! I was fortunate to find a set of Beck Arnley rubber rack bushings and did not hesitate to swap back to the OE coupler. Now, all is well with the steering feel. PS - I also swapped out the T/C rod poly bushings back to new rubber. Not a fix for steering but much better overall front-end behavior. I have 16" wheels with 205/55 tires. You did the common two variable experiment. Changed two things at once, confounding the results. Maybe it's the rack bushings. You didn't mention your steering wheel either. I think that all you can get out of these discussions is that it's not just one thing. You have to look at the path from road to hands and make your choices. Guilty as charged. I have a stock steering wheel and really did not want to mess with experimentation. I'm well satisfied with the sharpness of the steering with new tie rod ends, new ball joints, and the rubber content. I have heard of drivers making their own s-30 ZCAR steering couplers out of hockey pucks.